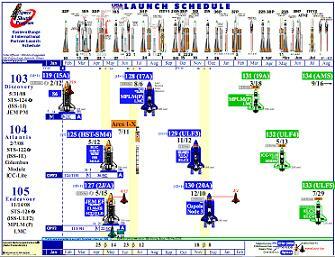 Shuttle managers have made extensive changes to their 2010 launch schedule ambitions, with the “inclusion” of STS-134 as an additional flight. Meanwhile, three additional External Tanks being worked on at the Michoud Assembly Facility (MAF) in pre-emption of a shuttle extension. According to planning documents on L2, STS-133 will now carry a Multi-Purpose Logistics Module (MPLM), while the “additional flight” of STS-134 – which is planning to carry the Alpha Magnetic Spectrometer (AMS), pending funding – continues to solidify its place in the forward planning. The Space Shuttle Program (SSP) manifests are planning documents, created by the Flight Assignment Working Group (FAWG), which are used to work out requirements ahead of being baselined into the schedule. The missions then undergo a series of reviews via the Program Requirements Control Board (PRCB), notably the Flight Definition and Requirements Directive (FDRD) review, as they officially line up in the shuttle schedule. Neither STS-133 or STS-134 have moved into that baselining stage, with STS-131 the latest mission heading to the FDRD – meaning they are not yet official missions. NASA and the contractor groups such as the United Space Alliance (USA) work off several schedules/manifests, in order to prepare flow timelines and create “need by” dates for the hardware that will fly on that particular mission, should that mission become baselined into the schedule. STS-134, which first appeared on the FAWG manifest last year as the LON (Launch On Need) flight for STS-133, has now become the AMS (Alpha Magnetic Spectrometer) flight on all three planning documents (FAWG, STS and ISS launch schedule, and USA’s ISS/STS and Eastern Range schedule – see left, available on L2). According to those planning documents, STS-134 will fly with Discovery, on a NET (No Earlier Than) September 16, with AMS-02 and EXPRESS Logistics Carrier-4 (ELC). It may also include the Remotely Operable Electrical Umbilical-755 (ROEU), which is also gains a place in the planning document on STS-132 and STS-133. STS-133 also changes from carrying two ELCs, to just one (ELC-3), with a MPLM – likely to be Leonardo – making up the vacant payload space/mass. The mission is currently working to a NET of July 29, 2010, flying with Endeavour. Previous manifests in 2008 classed both STS-132 and STS-133 as only CLF (Contingency Logistics Flights), and technically they remain as such until they’ve proceeded through the baselining process. Funding for STS-134 is yet to be arranged, although strong moves have already taken place at the Government level, which passed the a NASA Authorization Bill in late September of last year. The bill directs NASA to ‘take all necessary steps’ to add STS-134’s delivery of the AMS to the Station. However, it contains a caveat for the NASA Administrator to cancel the flight within one year of its launch, if it is determined that it will cost significantly more than the existing cost estimate, or that it would create an unacceptable safety risk. In such an event, Congress would then have to reauthorize the flight, or the President would have to certify that it is in the national interest to fly the mission. One old tank and two brand new tanks – all currently unmanifested on the planning documents – are being prepared for the opening salvo of additional flights that would be added in the event of shuttle extension. The confirmation that ET-122 – the tank that was damaged during hurricane Katrina, and subsequently removed from the flight manifest – has returned to production means a total of three additional tanks, post STS-134, are in early stages of processing. Tooling and floor space plans have also been created, in the event of extension, to ensure they do not conflict with requirements for the production of Constellation hardware. “Will begin this week to remove 5001 tool (tool that welds the dome door panels into quarter section) following all ET-141 welds,” added the Lockheed Martin/MAF information. “Will pull that tool out to make way for the upper stage for Ares. A full status update on shuttle extension will be published on Thursday.